Zombie Tooth paint has arrived at Thomas FX. As well, we also have received nicotine, decay, and brown tooth paint. 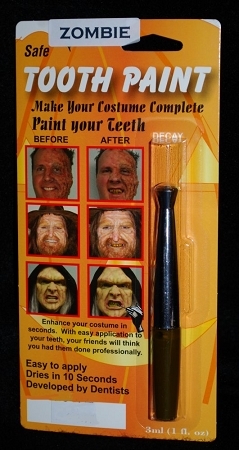 Temporary tooth paint is an inexpensive way to enhance any costume of makeup effects makeover. Order online, or shop in person at the Thomas FX bricks and mortor store in North Vancouver. Just a reminder, the Vancouver Zombie Walk is this weekend . . . Saturday August 18th at 3:00 pm . . . starting at the Vancouver Art Gallery at 4:00 sharp. Have fun . . . Stay safe . . . Don't hurt anyone . . . Don'd damage any personal or private propety. Special thank you to the hundreds of people who have already dropped into our store for zombie supplies!